A prohibitive tax had been imposed on salt by the customs service in the 15th century, and by 1805 this levy had reached £30 per ton. The salt tax was finally abolished in 1825, and by 1850 over a million tons of white salt were transported by barge around the country. In 1852 an engineer, John Corbett, designed a way of keeping salt mines airtight, further developing the British salt industry. 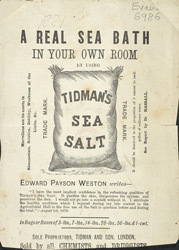 The coastal town of Maldon in Essex has been a centre for salt production since the middle ages and today is home to the Maldon Crystal Salt Company, which produces Tidman’s sea salt.